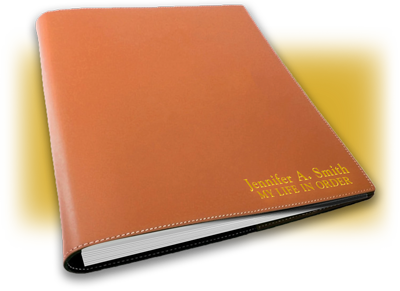 Give your family the gift of an organized estate assembled in a custom binder. MY LIFE IN ORDER is a highly personalized service designed for someone, just like you, who would like a convenient, custom and affordable way to capture a lifetime of memories and to document your wishes for the future - all in one place. In addition, MY LIFE IN ORDER helps ensure that your family realizes the maximum value for any personal property that may eventually be liquidated. In one beautiful book, you can ensure that your loved ones have all the information you want them to have, prepared by a seasoned professional, who will function like your own personal assistant. MY LIFE IN ORDER is designed to give you peace of mind but it will also make it easier for your family at a time when they may be most stressed. Even if you have a Living Trust in place, there can still be gaps to be filled. Let us walk you through everything we offer in the comfort of your own home. You will see that MY LIFE IN ORDER is perfect for any person with any size estate and the services are surprisingly affordable. At our initial meeting, which is at no charge, we will show you a complete book and then you can determine if this service is right for you. There is absolutely no obligation.